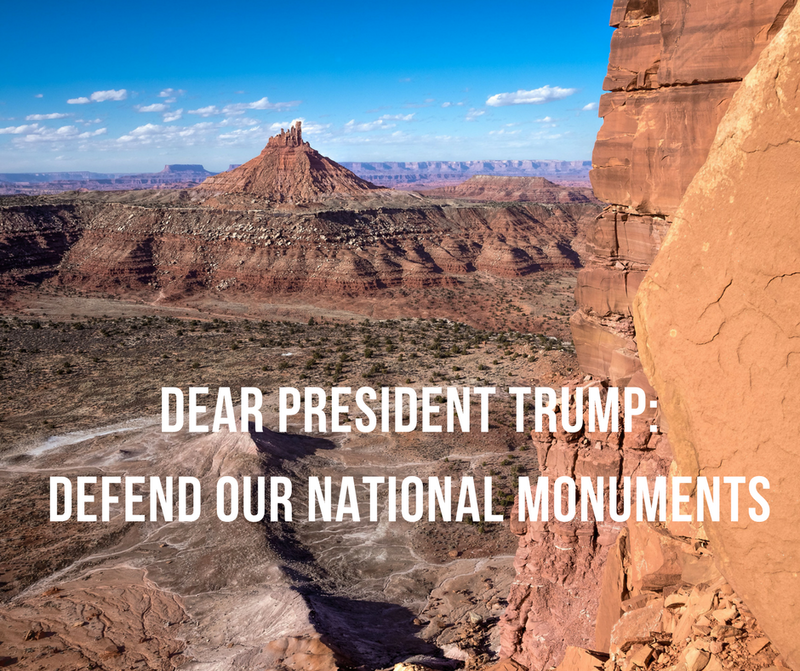 Yesterday, more than 20 organizations, representing hundreds of thousands of Americans, sent a letter to President Trump with one clear message: Protect our National Monuments. Read the full text of the letter below. Our country’s public lands and waters preserve cultural treasures, create lasting jobs, sustain important ecological benefits, provide recreation opportunities, and are a source of pride for all Americans. The American people, including the millions of outdoor recreation enthusiasts we represent, overwhelmingly support our public lands and oppose broad efforts to roll back protections, including for our country’s National Monuments. Over the course of the past summer, more than 2.7 million Americans wrote in to the Department of the Interior expressing their support for the Antiquities Act and our National Monuments. Since its enactment more than one-hundred years ago, the Antiquities Act has been one of our nation’s most critical tools for preserving our most important public lands and waters. Sixteen Presidents, both Democrat and Republican, have designated a total of 157 National Monuments across the country. We ask, will you continue in this tradition? Across the West and around the country, Americans have benefitted from and enjoyed the public lands protected through National Monument designations under the Antiquities Act. Although targeted at protecting areas of historic or scientific interest, protecting outdoor recreation opportunities has undoubtedly been one of the greatest secondary benefits of the Antiquities Act. Additionally, protected public lands play an essential role in mitigating the effects of climate change, and provide critical ecosystem services. Outdoor recreation is the means by which Americans experience these protected areas, and in the U.S., the outdoor recreation economy generates $887 billion in consumer spending annually, supports 7.6 million jobs, and generates $65.3 billion in federal tax revenue and $59.2 billion in local and state tax revenue. In a January 2017 Colorado College State of the Rockies Poll, 80 percent of American voters in the West backed keeping current National Monument designations in place. Americans want more protected public lands and waters, not less. Recreation users of all stripes have worked hard on locally-driven efforts to build support for National Monument designations in their backyards. These places are where we go to recreate, to form lasting experiences with friends and family, to bond with our past, and to give back. But these landscapes offer more than just recreation; they are a symbol of our country's immense diversity and the very fabric that weaves us all together. These monuments are a part of us, as much as we are a part of them. Millions of people, across the country and of all backgrounds have been advocating to protect these places for years. The voice of the recreation community has been loud and clear: protect these special places, protect the experiences Americans have now in these places forever into the future. Our organizations strongly oppose any efforts to undo existing protections established under the Antiquities Act. We are calling upon you to defend our collective American heritage and the century-old tradition of protecting and defending the landscapes that comprise our public lands network. By doing so, you will help to ensure the future of the 7.6 million hard-working Americans who rely on public land to support their jobs, as well as to ensure that we continue to maintain balance between resource development, where appropriate, and protection of recreation opportunities and our conservation heritage. Martin Palmaz, Executive Director, United States Hang Gliding & Paragliding Association, Inc.